MDF® has redesigned the Queen Square Hammer with neurologist Dr. Douglas Lanska to make it even more effective for eliciting myotatic, plantar, and abdominal responses. First popularized and named at the National Hospital for Nervous Diseases in Queen Square, London, this weighted, agile percussion device features a softer silicone bumper and blunted tip for patient comfort and ease of use for the healthcare professional. A removable grip and more flexible handle ensure increased percussion accuracy and effectiveness. 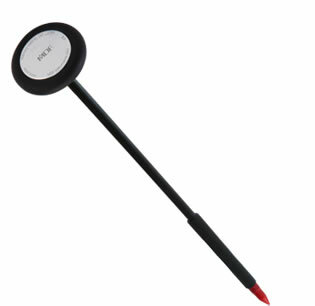 The red handle tip can be used as a target for testing visual fields.